Easy Harvest Recipes for apple, pear and peach pies! When you die, if you get a choice between going to regular heaven or pie heaven, choose pie heaven. It might be a trick, but if it's not, mmmmmmmm, boy. 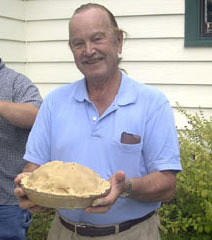 Jacqueline's dad, Charlie, made his first pie at our Pie Party! How can we have so much abundance and use it all? I understand it and at the same time I don't understand. In our affluent society, we turn up our noses at blemished fruit and vegetables. But I remember as a kid gathering wild apples that grew in our woods, we�d use nearly a half bushel to get enough for a pie. But that was the best tasting pie we ever tasted. Since that long ago time I've made thousands of pies. Now the apples are in, the peaches are in, the pears. If you don't make pies, you should. If you don�t want to make your own crust, buy ready made pie crust already pressed into a pan or any number of pie dough mixes. As for the fruit, you have it at your fingertips any time of the year, fresh, frozen, even in a can. Apples come fresh all year around or peeled and sliced in your freezer or already flavored and canned. Peaches come the same way but I think pears you'd have to buy fresh as I've never seen them frozen or canned for pie. If they�re canned in fruit juice, you only need to add a thickener, sweetener and flavoring and your pie filling is ready. I love to bake apple pies. I usually make at least two at a time because it is a bit of a mess and just as easy for me to make more. I bake one and freeze the other. Works out well when I want a wonderful smell in my house or when I need to seduce my husband into doing something he's not keen about doing. It works every time. I'll share a few recipes with you for these three harvest fruits. And don�t feel guilty if you don�t use fresh. You will get the same great smells and oohs and ahhs using frozen or canned fruit. You�ll need a crust for the bottom and top of the pie. This is what goes inside. You will use about 4 cups sliced and peeled apples for each 8-9 inch pie. I like to use a variety of apples. Macintosh, Granny Smith, and any of the other cooking apples. If you are buying them and don't know if that type of apple is meant for cooking, ask. Not all are. Some people like to add butter. it adds an element to the flavor but I don't use it. Add a tablespoon if you like. Mix all together, pour into lined pie plate, wet the edge with beaten egg and cover with top crust. Brush the top with the egg and sprinkle with sugar or ground almonds. Make slits for steam and bake at 350 degrees F for about one hour. I don't know how this came to be called French, but it's the only way I've ever known it. I love this pie. It has almost a mincemeat flavor. Pour 3-4 cups sliced and peeled apples into a large skillet with a quarter cup of butter or margarine. Saute over medium heat until apples begin to cook. Stir until apples begin to soften. Turn off heat. Line a pie plate with dough and pour apple mixture into it. Wet edges as above and cover with top crust. Brush top crust with egg and bake as above. This pie will be flatter than the apple pie since the apples have already cooked to down before you put them in the oven. After you take it out of the oven, let the pie cool for about an hour. Put 1 cup confectioner's sugar into a small bowl and add to it one egg white. Beat together with a teaspoon of fresh squeeze (if possible) lemon juice. Pour over top of pie. Let cook completely and enjoy. This is a wonderful discovery I made a couple of years ago when I was Jacqueline's home at harvest time. They have an orchard and also had an abundance of pears so we began adding them to the apple mixture. I didn't taste much difference but it made a wonderful pie. Try it with the first recipe (Apple Pie) but use 2 cups apples and 2 cups of sliced pears. Season and cook the same way. I was very pleased with the results. Okay, so I'm a bit lazy in my old age. I made several peach pies this year. I went to health food store and bought organic fruit. I peeled them as the juice ran down my elbows, made the pie and enjoyed the accolades from our friends at the dinner table. Another time I bought frozen sliced peaches at the market, made pie and heard the same remarks. Take that for what it's worth to you. To me, it means that until I'm blessed with my own peach tree (unlikely here in Southern Florida) I'll opt for the frozen peach slices. The result seems to taste the same. You will need about 4 cups prepared fruit. Pour fruit in a large bowl. You will need to add closer to a half cup of flour as the peaches are much juicier. Stir the fruit mixture and pour into lined pie plate. Wet edges and cover with top. Brush the top with the egg, makes slits, sprinkle with sugar and bake at 350 degrees F for about 1 hour. I hope you'll bake a pie, even if it's only a frozen one you got at the store. To make it look more homemade, brush the top with beaten egg, sprinkle some sugar over it so it sparkles, bake it as directed and listen for appreciation around your table. Have fun! I would love to hear your suggestions for more recipes or hear how one of these recipes came out. What would you like to know how to make? My email address is auntiejune@aol.com. Send me an email and say hello! Strawberries and rhubarb are in season. Cookbook author June Entwistle sent three easy recipes.